You are here: Home / Audacious Royalty / Why is 91-year old Queen Elizabeth II a Strong Woman? Queen Elizabeth II is a strong woman. At 91 years old, she’s kept the same job she’s had for 65 years. Her son, Prince Charles, is 68 years old. He has long given up the idea that he’ll get the throne. Her husband, Prince Philip, is 96 years old, and he announced this year that he will no longer make public appearances. In other words, he’s not playing the role of her companion in public any more. Queen Elizabeth saw England being bombed and almost falling to Germany during World War II. With World War II raging, the 18-year-old Elizabeth begged her father to let her help the war effort by serving in the Women’s Auxiliary Territorial Service, a branch of the British Army. It must have made an impact on her. She would have been able to see the sacrifices necessary to win the war. While the Territorial Service women were not sent to battle, they undertook support tasks and were still at risk. In 1947, a few years after the end of the war, Queen Elizabeth very practically used ration coupons to pay for the material for her wedding gown. It was not a lavish ceremony. Her life still demands quick thinking against an opponent. In 1981, during her birthday celebration parade, she was shot by a teenager while she rode her horse. Fortunately the teenager fired blanks and was arrested. The Queen calmed her horse and continued the parade. A year later, she awoke to find a man in her bedroom dripping blood from a cut hand. She calmly chatted with him about his family until a footman seized the intruder. 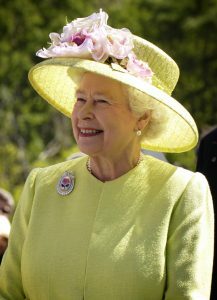 Over the last few decades, many have speculated that the queen will retire, and each time, they’ve been proven wrong. I’m glad. I like to think of a strong woman at the helm of England’s monarchy.